Crispy brown, lightly fried low carb cauliflower fritters make a great breakfast! This easy method produces fritters that crisp up perfectly. 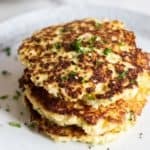 Flourless and keto cauliflower fritters. 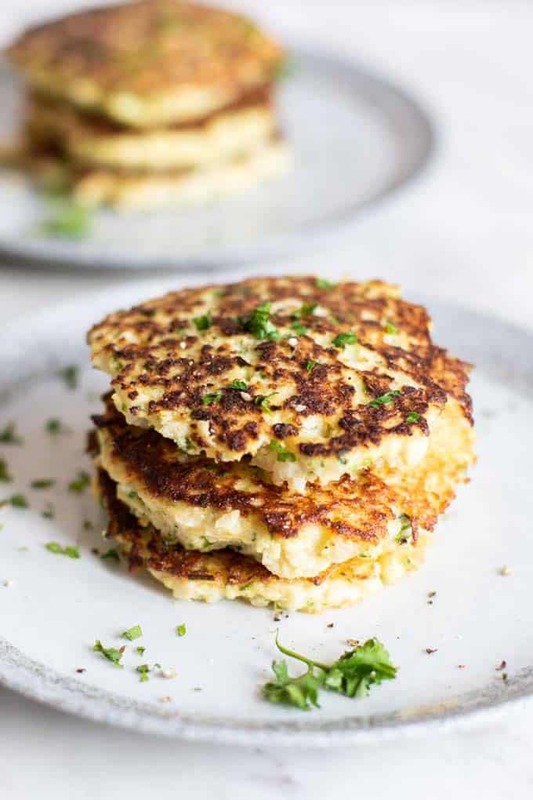 If you’re looking to change up your low carb breakfast routine, these healthy cauliflower fritters are just the ticket! I have tried to make cauliflower fritters in the past, but always ended up with them being too watery to really crisp up golden in the frying pan. This time, I used the trick I use for cauliflower pizza crust — after I riced my cauliflower in the food processor, I precooked it, and then squeezed out the excess moisture. Super simple, basic canvas for the perfect crispy cauliflower fritters. Heating a skillet over medium high heat. Form the cauliflower batter into patties, and add around the preheated skillet. Allow to come to a golden brown, about 5-7 minutes, and then flip to crisp up the other side. If you’re following a keto diet, and would like these cauliflower fritters to be higher in fat, add extra oil for frying. These fritters turn a deep golden brown using only a small amount, but you could crisp them up more by adding additional oil. Try adding shredded cheese to the mixture, like parmesan or cheddar. Serve with my creamy Avocado Sauce or just top with avocado slices. 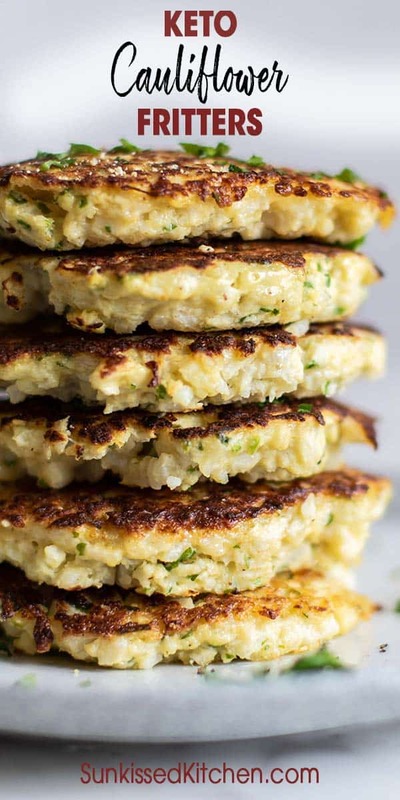 Breakfast just got better with these easy cauliflower fritters. Low carb, and lower in calories than hash browns, they make the perfect base to make a beautiful breakfast. Enjoy them simply by serving them with chopped tomatoes and sour cream. I personally love ketchup on them, just like I was eating hash browns. You can top a stack of these with eggs, or use sausage, like I did in these cauliflower fritter sausage stacks. However you choose to dress them up, I am sure they will become a new favorite in your house! Save time by buying prechopped cauliflower rice, available at most grocery stores and Costco now. 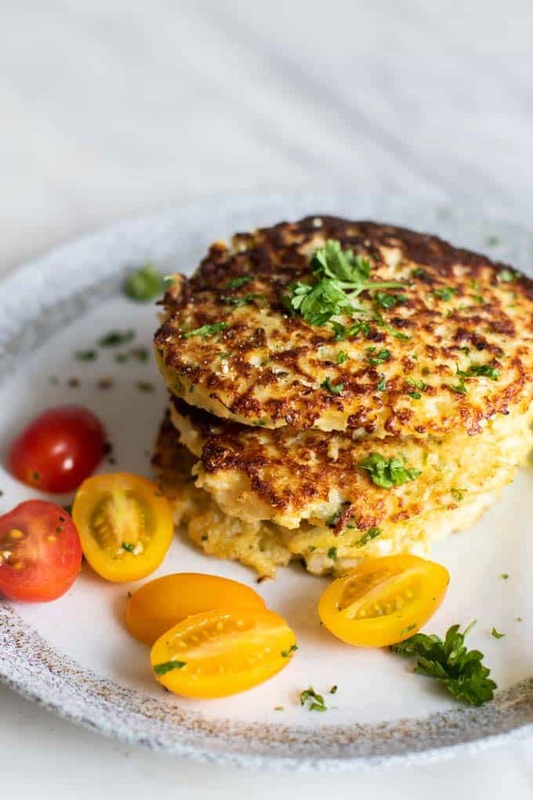 An easy cauliflower fritters recipe sure to crisp up to golden brown every time. 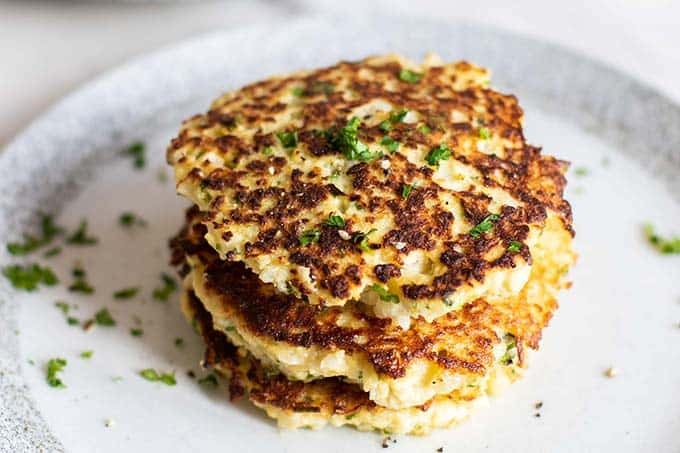 This low carb cauliflower fritters recipe uses gluten free almond flour and makes the perfect base to so many breakfasts! Rice cauliflower in a food processor until coarsely chopped, slightly larger than typical cauliflower rice. Using store bought riced cauliflower will work also. Add cauliflower to a large microwavable bowl or dish. Microwave for 4 minutes. Alternately, add to a steamer and steam for about 7 minutes on the stovetop. Add cooked riced cauliflower to a large thin dish towel, and twist to squeeze the excess water out of the cauliflower. Try to squeeze out about 3/4 of a cup of water. Add the cauliflower, almond flour, parsley, egg, salt and pepper to a bowl, and mix well to combine. Add 1/2 tablespoon of avocado oil to a skillet over medium heat. Add 2 large mounds of the cauliflower mixture. 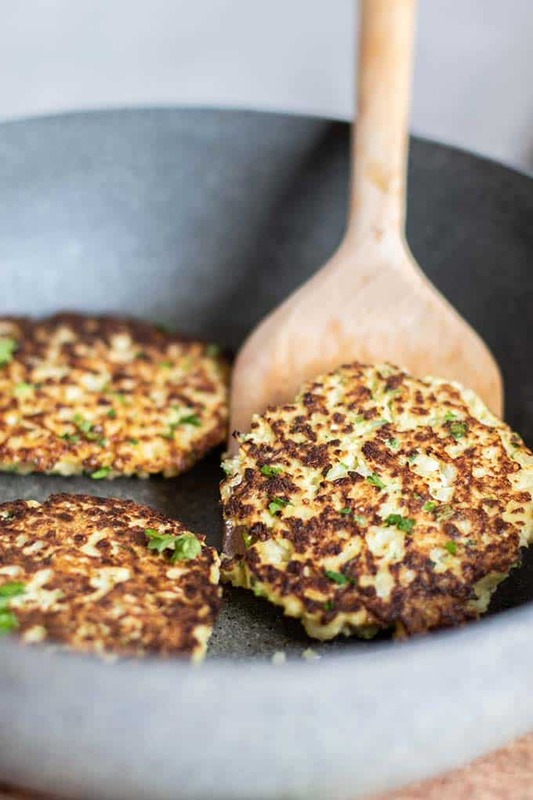 Cover the skillet to allow the cauliflower fritters to solidify so they are easier to flip. Brown the cauliflower for about 5-7 minutes before flipping. Allow the second size to cook to golden brown, then serve hot. This Cauliflower Fritters post may contain affiliate links, meaning if you make a purchase, I will receive part of the sale as a commission. This helps me continue to bring you lots of fresh and inspired recipes! Can’t wait to try these. What’s the serving size for the nutritional facts? 95 calories for one fritter or for all 8? What a great way to start the day! I'm always after new breakfast ideas and these look fabulous! I definitely see a lot more fritters in my future! What a great way to increase your veggie intake. These would be great with a poached egg on top. I am loving these! they sound so easy to make and delicious. I love those brown crispy parts on the outside! I've substituted cauli when making mashed potatoes, I can't believe I've never thought about this for breakfast! It's so perfect!! I'll be making these this weekend.